Ouray, Colorado is a historic mining town located on the Million Dollar Highway in southwest Colorado. Sitting in a natural rock amphitheater at an elevation of 7,792 feet, the community that is so beautiful it is often called the Switzerland of America. The town is named for Chief Ouray of the Ute Indian tribe, who had long made this area home before miners began to arrive. The nomadic Tabeguache Ute Indians had utilized this beautiful valley in the summer months for centuries, hunting the abundant game and soaking in what they called “sacred miracle waters.” The Ute called the area “Uncompahgre,” which was their word for “hot water springs.” Chief Ouray once lived in a small cabin at the foothills of the natural amphitheater. 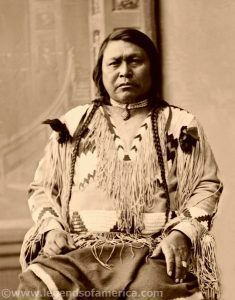 When white men began to push into the Ute territory in the 1860s, Chief Ouray initially dealt with them with patience and diplomacy, so much so that he was often referred to as “The White Man’s Friend.” This changed, however, with the discovery of gold in Colorado and miners in great numbers began to encroach upon their lands. After several treaties were made and broken, the Ute were finally pushed out of the area and miners flooded the region. 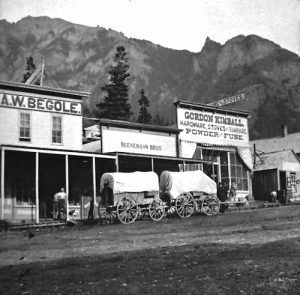 The town of Ouray had its beginnings in 1875 when prospectors from Silverton worked their way into the area via Bear Creek and the Uncompahgre River searching for ore. The first recorded claims were made by A.W. “Gus” Begole and John Eckles in July. After they returned to Silverton for supplies, they were followed back north by several others and a mining camp was established. Nearby, prospectors made claims on the Cedar, Clipper, Trout and Fisherman lodes. Another site called Mineral Farm was also located about 1.5 miles south of the mining camp and became one of the most prosperous early workings in the area. 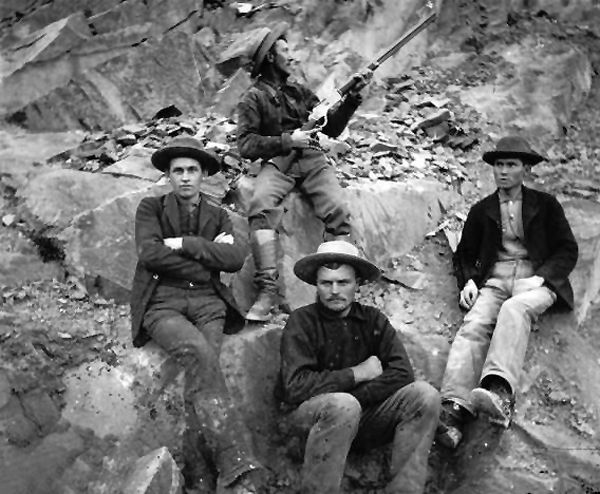 By the spring of 1876, more miners made their way to the area and the town was surveyed and formally incorporated in October 1876 as the town of Ouray. Within no time, it boasted a population of 400 people and 214 buildings, most of which were made of logs. These structures included a school with 43 students, four general stores, one sawmill, an ore sampling works, two hotels, and a post office. In the meantime, more rich discoveries were made at nearby Imogene and Yankee Boy basins. Ouray became the major supply center for these new strikes. 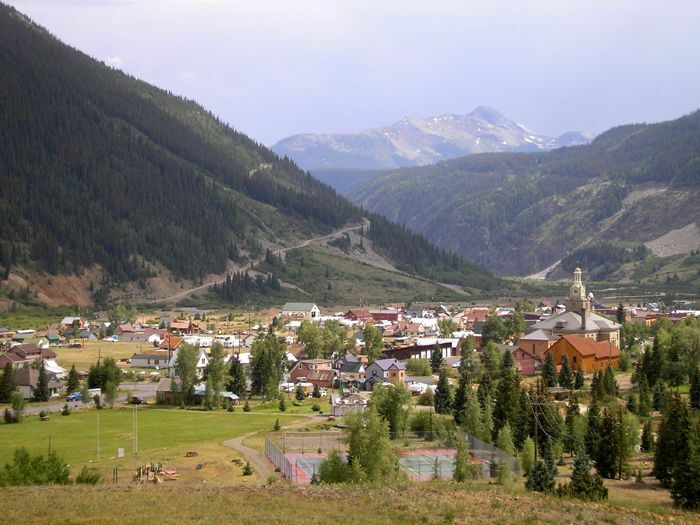 In January 1877, Ouray County was formed out of San Juan County and Ouray became the county seat. At that time, the town was called home to about 1,000 residents. By 1880, significant ore deposits had been found in the area, with the greatest concentration of high-quality ore found in the Ironton area 10 miles south of Ouray, and in the Sneffels District and Imogene Basin workings to the west and southwest. At that time, Ouray became the shipping point and supply center of the region, a role that it would serve for over 90 years. The Red Mountain Mining District came into its own in 1882 and Otto Mears constructed a toll road from Ouray to the new district. By that time, Ouray was taking on the trappings of a true urban center, as brick buildings began to replace the wooden ones. 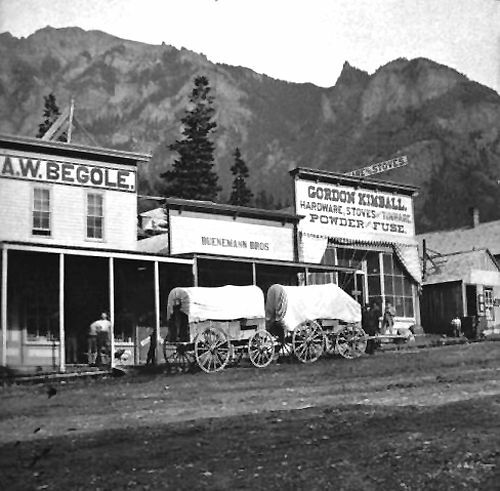 By 1885, Ouray boasted a population of 1800 people, two weekly newspapers – the Ouray Times and the Solid Muldoon, an ore sampling works, a 10-stamp mill, a bank, three churches, several schools, and numerous restaurants, hotels, saloons, and fraternal organizations. 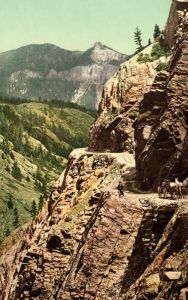 The same year, Otto Mears, who had built an extensive network of toll roads throughout southwestern Colorado in the past decade, finalized his “greatest road” – the predecessor of the “Million-Dollar Highway” between Silverton and Ouray. This rugged toll road followed the Uncompahgre River gorge, crossed Red Mountain, and skirted a narrow ledge hundreds of feet above the canyon floor.